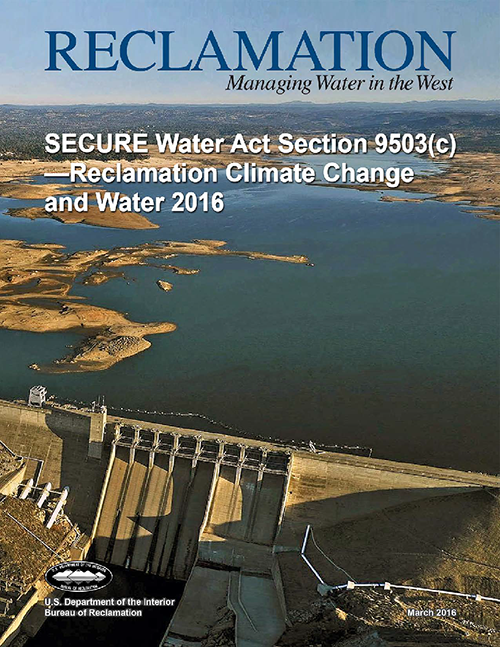 The SECURE Water Report identifies climate change as a growing risk to Western water management and cites warmer temperatures, changes to precipitation, snowpack and the timing and quality of streamflow runoff across major river basins as threats to water sustainability. Water supply, quality and operations; hydropower; groundwater resources; flood control; recreation; and fish, wildlife and other ecological resources in the Western states remain at risk. The report, which responds to requirements under the SECURE Water Act of 2009, shows several increased risks to western United States water resources during the 21st century. This is the second report produced for Congress. The first report was produced in 2011.
a 7 to 27 percent decrease in April to July stream flow in several river basins, including the Colorado, the Rio Grande, and the San Joaquin.